As debate heightens about the transport of dangerous goods by rail, another Canadian National Railway train derailed early this morning about 25 miles NW of Duluth, Minnesota (Star Tribune). 13 of 107 cars derailed, 3 of which were loaded with naphthalene, a hazardous material best known as the active ingredient in mothballs. St. Louis County Emergency Services Manager Scott Camps said there is a “potential for release of naphthalene when they have to off-load the product from the damaged cars”. Preliminary information suggests that some or all of the other derailed cars were loaded with plastic pellets. Read CN Railway Derailments, Other Accidents and Incidents for information on hundreds of other CN derailments in the U.S. and Canada. 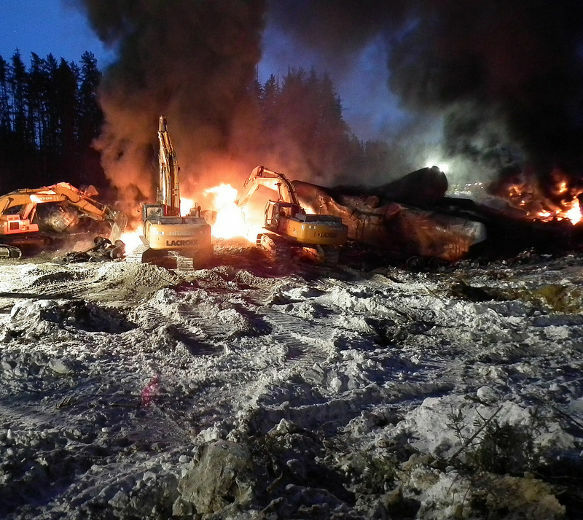 Twenty-nine of 100 tank cars loaded with crude oil from Alberta’s tar sands area derailed about 80 km south of Timmins, Ontario around midnight February 14, and 7 cars were still burning 4 days later (many media sources). The derailment occurred in a remote area on Canadian National Railway’s mainline. Firefighting and environmental crews and equipment are still at the site. As a result of the derailment, which is still blocking CN’s mainline, Via Rail has cancelled all passenger service between Toronto and Winnipeg until the rail line can be cleared. Via made alternate arrangements for those passengers already en route or due to travel since the derailment. Access to the remote site is challenging for emergency crews, and it will be difficult to determine the volume of crude oil spilled and the extent of environmental damage. CN is not sure when the mainline between Montreal and Winnipeg will reopen, and has said shippers should expect delays. CN has been asked to keep Ontario Environment, Environment Canada, Health Canada and nearby First Nations updated. Transport Canada and the Transportation Safety Board (TSB) of Canada are involved in the derailment investigation. Earlier in the morning of the same day of the CN derailment in Ontario, 12 Canadian Pacific Railway tank cars loaded with crude oil derailed in the Crowsnest Pass in southern Alberta (Railway Age). Two of the derailed cars toppled over on their sides, and their loads had to be transferred into 3 rescue tankers dispatched from Lethbridge. Then on February 16, about 27 CSX tank cars loaded with Bakken crude oil derailed near Charleston, West Virginia. About 15 of the derailed cars caught fire and several plunged into the Kanawha River, spilling an undisclosed amount of oil. 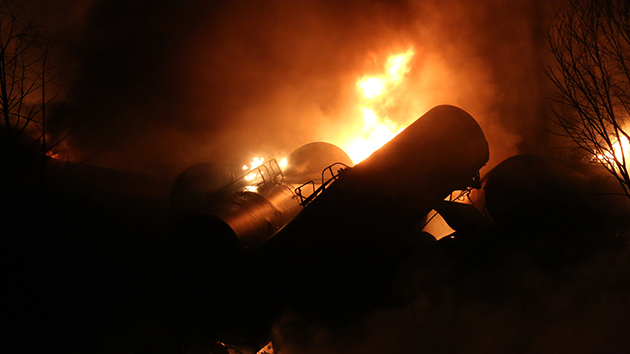 These latest derailments, spills and fires intensify the growing debate on the hazards of transporting crude oil and other dangerous goods by rail. The focus of the big railway corporations on the bottom line and their stock performance, at the expense of rail safety, continues to worry Canadians and Americans. Homeowners, businesses and industries located near rail lines are particularly concerned because they are most susceptible to the dangers of derailments, spills, explosions and fires. For hundreds of examples of additional Canadian National Railway derailments in Canada and the U.S., read CN Railway Derailments, Other Accidents and Incidents, and see this link for more information on the many hazards associated with transporting crude oil by rail. “Actions speak louder than words” – this is a phrase that most definitely applies to Safe Rail Communities, a Toronto-based “non-partisan, community organization advocating for transparency and safeguards with respect to rail safety in our neighbourhoods”. The organization “is calling on the federal government for genuine safeguards and transparency regarding the transport by rail of volatile crude oil and other hazardous material”. 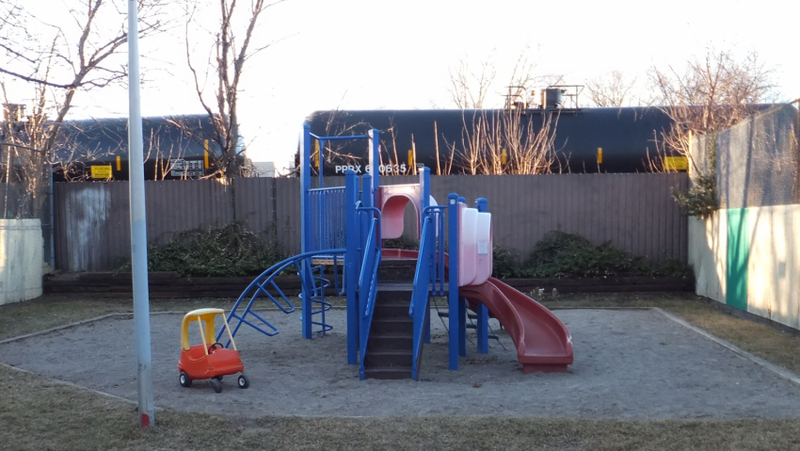 Instead of simply writing about improving the transport of crude oil and other dangerous goods by rail, Safe Rail Communities (SRC) has recently taken action, on several fronts, in an attempt to bring about meaningful and much-needed changes. A brief summary of some of Safe Rail Communities’ initiatives follows, with permission from SRC. Railroaded encourages you to visit their website to get the details. SRC has produced two one-page summaries on their main concerns and call to action (see Summary 1 and Summary 2). They point out that there has been a whopping 28,000% increase between 2009 and 2014 in the number of rail tank cars transporting crude oil across Canada, and it is projected to increase by almost 4-fold again by 2016. These “Bomb Trains” travel daily through our densely populated areas and along our streams, rivers and lakes where derailments can be deadly and cause major environmental disasters. The Transportation Safety Board (TSB) of Canada has warned the rail industry and Transport Canada since 1991 about the defective DOT-111 tank cars that puncture easily during derailments and other accidents. Although modest changes have been made, rail companies and shippers have been given far too long to get rid of these cars or to retrofit them. The Auditor General has criticized Transport Canada numerous times, pointing out that the federal department has completed only 26% of its planned audits of federal railways over a 3-year period. Despite increases in hazardous shipments by rail, and promises of tougher standards for tank cars and other safety measures, Transport Canada has cut the railway safety budget by more than 20% over the last 5 years. Other concerns raised by SRC include the fact that railways do not carry enough insurance to cover the costs of a catastrophic derailment. This can be particularly alarming when we learned that crude oil from the Bakken region, North Dakota, is more volatile than traditional crude oil, and is shipped by rail through many Canadian cities, towns and villages. The issues of sufficient insurance coverage and the volatility of Bakken crude tragically came to a head when Canadians and the world watched in horror the devastating results of the derailment disaster in Lac-Mégantic, Quebec, on July 6, 2013, where the spill, explosion and burning of crude oil killed 47 people, levelled much of downtown Lac-Mégantic, and caused major environmental damage. SRC points out what has become extremely frustrating to municipalities and residents across Canada – that CN and CP are required to provide first responders with only historical data (not real-time data) of dangerous goods being shipped through our neighbourhoods. Residents living near rail lines and the media are prohibited from receiving this vital information. On December 29, 2014, SRC forwarded a 14-page submission to the Canada Transportation Act Review Panel which considers “limits of the current act as it relates to rail, as well as addresses broader concerns related to rail safety”. SRC has made sound recommendations to the panel on railway air quality, noise level, speed, safety technology, tank car standards and accident insurance. The SRC document also contains an excellent list of references on tank car standards, the carcinogenic effects of railway diesel engine exhaust, and more. SRC submitted an Environmental Petition to the Auditor General of Canada, Commissioner of the Environment and Sustainable Development, on January 28, 2015, titled “Environmental risks and the increase in hazardous goods transported by rail”. To quote one sentence of SRC’s background to the petition, “Given the significant increase in shipments of crude oil and hazardous goods by rail, concerns about the safety of the railcars, and quality of life impacts on Canadian communities, we submit this petition to the Government of Canada to identify the actions taken to study and mitigate the impact to the environment and to protect the health and well-being of Canadians.” The petition contains 17 questions addressed to Transport Canada and Environment Canada regarding: tank car standards, transport of the particularly volatile Bakken region crude oil, ability of the public to voice concerns about rail safety legislation and regulations, the need for environmental and public health studies related to the dramatic increase in crude oil transport by rail, speed of crude oil trains, risk assessments of crude oil shipment routes, the true financial and environmental costs of a catastrophic derailment, environmental impacts of the 2013 Lac-Mégantic derailment disaster, adequate railway accident insurance coverage, and details about Transport Canada’s cuts to rail safety budgets. And finally, SRC has developed this public petition calling on the federal government to make meaningful improvements to rail safety in Canada. SRC encourages people concerned about the skyrocketing increase in the transport of crude oil and other dangerous goods by rail to collect signatures using their petition (or creating their own). You need only 25 signatures to get your MP to present the petition in the House of Commons. SRC also encourages Canadians to direct questions and concerns about rail safety to your MP, through other means. Railroaded strongly supports SRC’s initiatives, and we encourage people across Canada to get this petition signed and submit it to your MP. See this link for additional information on the many hazards associated with shipping oil and other dangerous goods by rail, and this article in the Vancouver Observer for quotes directly from members of SRC. Two Canadian Pacific Railway locomotives and 13 cars derailed yesterday in a remote location north of Dubuque, Iowa (Telegraph Herald, Raw Story). At least 11 of the derailed tank cars were loaded with ethanol – 3 of the tank cars caught fire and were still burning this morning. Local firefighters decided to let the fires burn themselves out. Another 3 cars plunged into the Mississippi River. Ethanol spilled into the river, and downstream communities were notified by the Department of Natural Resources. Emergency officials established a ½-mile evacuation zone around the train. The remote stretch of track where the derailment occurred made access difficult for emergency crews who were worried about water contamination and the possibility of an explosion. The local fire chief said he expected the clean-up to take days to complete. The extent of environmental damage has not yet been determined. Ethanol is highly flammable and explosive, and derailments of ethanol tank cars have caused deaths, injuries and serious damage in the past. 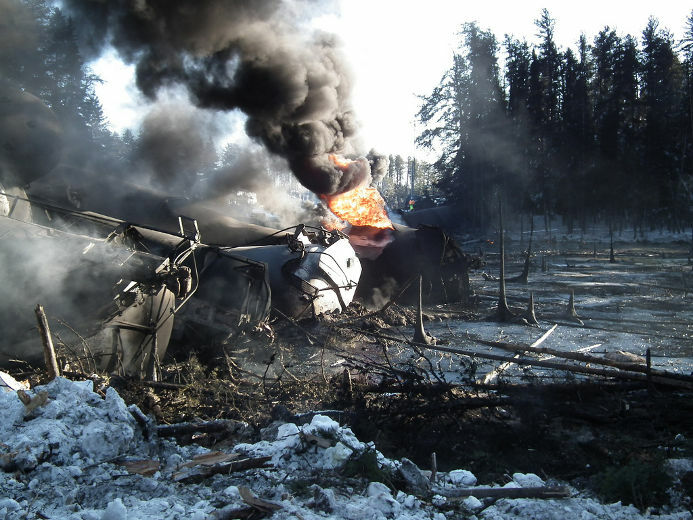 One such incident in Cherry Valley, Illinois in 2009, saw the derailment of 19 Canadian National Railway tank cars loaded with ethanol, resulting in explosions and fires that killed a person and injured 7 to 10 others who were stopped at a nearby railway crossing. A total of 60,000 gallons of ethanol spilled into a local river and resulted in the single-largest fish kill that was not a natural fish kill in the history of Illinois. This latest derailment, spill and fire will undoubtedly add to the growing debate about the dangers of transporting dangerous goods by rail. The Transportation Safety Board (TSB) of Canada says it remains concerned about the federal government’s legislative oversight of rail safety, 18 months following the derailment, explosions and fires that killed 47 people and leveled much of downtown Lac-Mégantic, Quebec (Globe and Mail). Both the TSB and the Auditor-General have found significant flaws in the oversight of in-house safety management plans developed by railway companies. Some railway safety experts have gone further and accused the federal government of letting railway corporations regulate themselves. While the TSB acknowledged progress on some rail safety issues, it said Transport Canada must do more to ensure railway companies are following their safety management plans. During the past 2 decades, the TSB has made many safety-related recommendations as part of their investigations of derailments and other railway accidents and incidents, but many of their recommendations have not been adequately addressed or not addressed at all by rail companies or Transport Canada. 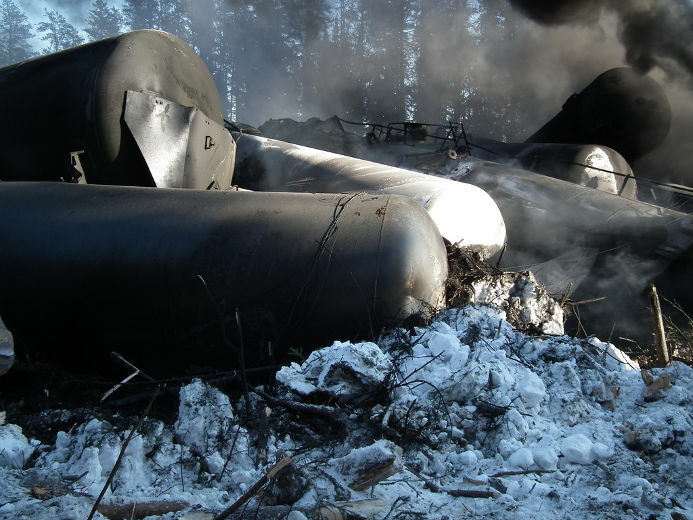 Deteriorating rail infrastructure, dangerous goods tank cars that puncture easily during derailments, and insufficient adherence to safety measures by railway company senior management, have led some railway employees to label crude oil trains as “BOMB TRAINS”.